I've never had a 4 1/2 year old before. The learning curve is steep, I tell you what. One of the side-effects of raising a preschooler appears to be a proliferation of their art. I'm happy for it, I love to see Sir O all wrapped up in a creative pursuit. But then there's the predicament. What to do with the piles and piles of drawings? Anyone want some? I'll be happy to mail you a bundle. 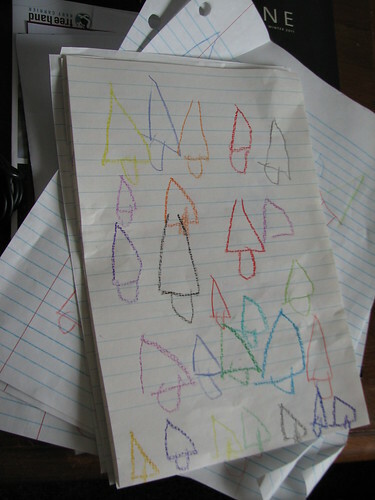 Mostly he draws "Christmas Trees" or "people with houses" And occasionally "Valentine Hearts". If he doesn't like how a specimen is shaping up, he'll just put an exasperated "X" through it and move on to the next one. I try to intervene as little as possible, primarily to keep the crayons from being strewn all over the house. There are inevitable casualties (usually clothes and markers colliding - the clothes never seem to win). And the other day I caught him going nuts with the dry-erase marker Mr Renn has been leaving me love notes on the bathroom mirror with. 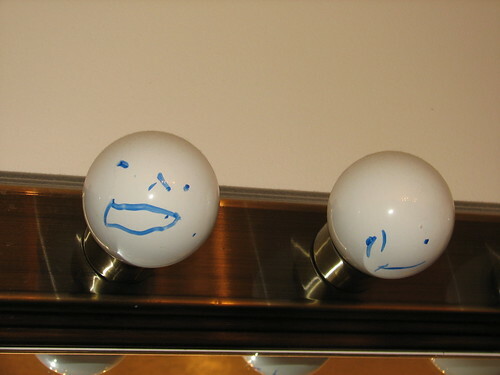 He'd turned the bathroom vanity light bulbs into a chorus line of smiley faces. I wasn't sure whether to laugh or be furious. (Visions of exploding lightbulbs and all...). When you have three little people that you can't afford to turn your back on - the only practical solution is to handcuff them all to each other so your eyes only have one place they have to be. Oh wait, that's not practical? Well then, the chaos must continue. Yeah, I'm not really sure what to do with the piles and piles of artwork. I think I need to go through it all, choose a few to keep, and toss the rest. They're just so funny and cute I can't do it right away. The little faces on the bathroom lights crack me up. Awesome creativity there. i like the smiley light bulb chorus. Oh thanks for the good chuckle!!! Imagine how happy those light bulbs will look when they're all lit up. Too cute. I can laugh at posts like this because I have a feeling that I'm just a few years behind you. Little boys are endlessly inventive when it comes to trouble. especially when it involves permanent ink.